The INDATA Project offers several free resources such as blogs, podcasts, and the Equipment Lending Library. In addition to all these services, we also offer a device reutilization program through the INDATA Depot. This program takes donated equipment (e.g. laptops, computers, CCTVs, etc.) and refurbishes them to give away to Hoosiers with disabilities. Volunteers play a huge role in refurbishing this equipment. 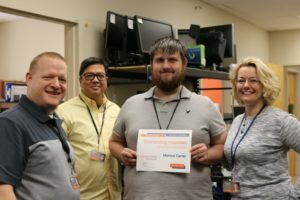 The INDATA Project would like to congratulate Marcus Carter as Volunteer of the Year! Marcus began volunteering in the Depot in 2014. Alvin Alviar and Tracy Castillo (from the INDATA Depot) noted that he has great researching skills – no matter the topic. 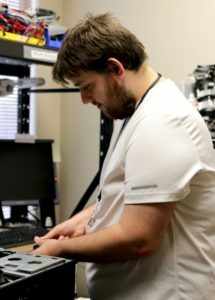 They also highlighted that he was able to solve many of the most complex PC-related problems encountered in the Depot. “As I hear it, Marcus has grown up at Easterseals. I have witnessed a lot of growth from Marcus. I believe this growth is due to his willingness to learn and develop his skill and professionalism. Please email Alvin Alviar at aalviar@eastersealscrossroads.org if you have any questions.